A lady who had become widowed found that upon moving into a flat in New Whittington, various strange phenomena were occurring, including hearing voices, being touched in bed, a teapot flying down of its own accord and an unnatural coldness. The matter was investigated on behalf of ASSAP by Jean Porter, assisted by the author. Between 1990 and 2000 a number of isolated incidents occurred at a bungalow in North-East Derbyshire, involving the apparently inexplicable movement of, or falling of, objects. This included a glass fronted frame collapsing onto the floor and smashing, a rocking chair rocking by itself and a picture falling off the wall. The lady of the house and her son also experienced strange sensations and visions in their bedrooms. The case was investigated on behalf of ASSAP by the author, assisted by Mike Rush. Tests were carried out, observations were made regarding unusual energy sources and the details of the phenomena arising from the interview of the lady of the house were analysed. Explanations for most of the phenomena were thus found, the details being given in the reference below. In 1996 Mr Thompson [pseudonym] moved into a cottage which was located on the edge of a farm within North-East Derbyshire. Since living there (on his own) he experienced spontaneous psychokinetic phenomena on a very large number of occasions. These were typically strange effects with electrical equipment or objects being asported and sometimes reapported. Incidents included the cooker alarm sometimes going off for no reason, the cooker turning itself on and off, the bathroom light coming on, the owner’s clothes being moved and an attachment fixed to the end of the curtain rail being thrown across the dining room, just missing Mr Thompson. In 2002, the phenomena were investigated on behalf of ASSAP by the author, assisted by Tamsin Ashmore. By that time, phenomena were occurring less often. Mr Thompson alleged that a visitor that year thought that she had taken the paranormal influence back to her house with her, as she had had some activity in her own house since. A young lady living in North-East Derbyshire who had been in and out of hospital over a period of 15 years reported being the subject of a psychic attack. She suffered terrible pain around the lower abdominal area as well as headaches and claimed that a relation of hers in India was using psychic powers to induce the pain in her. The matter was investigated on behalf of ASSAP by Jean Porter, assisted by the author. At a Victorian school in North-East Derbyshire a teacher by the name of Josie once saw a pupil get up and walk out of the classroom without first asking permission. The Teaching Assistant didn’t see this image and a headcount revealed that all the children of the class were actually still in the room. 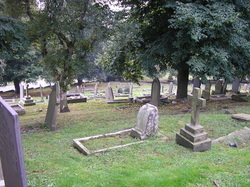 The churchyard of St Lawrence’s Church has a reputation of being haunted by a ‘Mad Monk’, who is seen by many people (mainly between 12 and 3 a.m.) wearing brown robes and wandering amongst the gravestones, clutching a wooden cross. During a night-time investigation by Chesterfield Paranormal Research Bureau, one investigator became possessed, fell to the ground and starting chanting in Latin (a language of which he had no knowledge). Liz Stone used to participate in a psychic awareness group, known as Spire Paranormal Group, run by the medium Yvonne Gregory. As part of the training, Yvonne would take selected members to some allegedly haunted premises to see what they could detect. One such visit was a night-time call to this particular location. The hairs on the back of Liz's neck stood on end, as she was very aware of a very nasty presence watching her and making her feel decidedly uncomfortable to the extent that she wanted to leave the area. She was told that a corrupt, and possibly abusive, religious person had frequented the area. Presumably a visit from this entity was causing her discomforture. Apparitions of a young woman carrying young children are seen during the winter months. It is said that on the adjacent Market Street, Church Hill, there have been instances of motorists running over a person in the road who is then found not to physically exist. About 1840, the Parish Clerk of Norton and his apprentice were about to play the organ, when the apprentice noticed a female spectral figure sitting in one of the pews. Thereafter the Clerk would never play the organ when it was getting dark.